Whats the best creatine supplement to take before any workout? 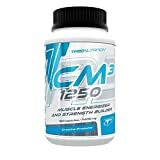 CM3 1250 creatine supplement is a product containing an improved creatine formula in its most bioavailable form, 100% creatine malate (tri – creatine malate) . For years now creatine supplements have been the most popular and effective substance used in body building and other professional sports while building muscle strength and mass and always taken before any workoutIng comparison to the traditional creatine monohydrate supplements. Creatine malate is characterised by better stability (does not become reduced to valueless creatine in the gastric acidic environment), and absorption (significantly more quickly absorbed in blood stream), which results in storing a larger amount of creatine in a muscle cell. Consequently, the body may use even larger doses of anabolic and erogenic substances, which leads to even better muscle mass and strength gain results in comparison to the traditional creatine monohydrate. .
Training days: CM3 1250 should be best applied: . 1st dose 30 minutes before breakfast . 2nd dose 30 minutes before workout . 3rd dose directly after workout. .
2nd dose 30 minutes before your evening meal. .
Wash down with 200-300 ml water. . Note: KING SIZE MAX DOSE – is a trade mark which signifies the maximum dose of the active substance which was achieved in laboratory conditions per 1 capsule, in this case 1250 mg creatine malate per 1 capsule.